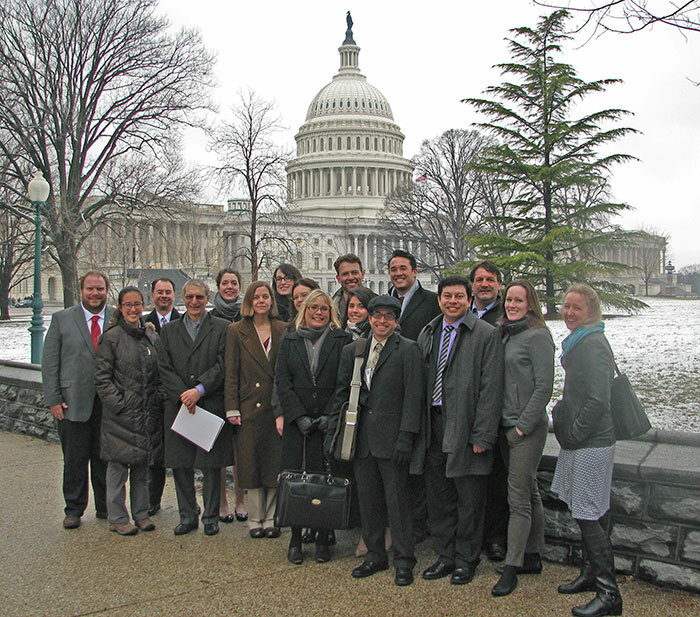 Fifteen members of the American Astronomical Society (AAS) traveled to Washington, DC, 25-26 March to thank Congress for recent appropriations supporting the astronomical sciences and to express the need for sustained and predictable federal funding of scientific research, which is critically important to American economic growth. The delegation was part of a group of more than 275 scientists, engineers, and business leaders from nearly all 50 states converging on Capitol Hill for the 19th annual Congressional Visits Day (CVD), sponsored by the Science-Engineering-Technology Work Group. CVD is coordinated by coalitions of companies, professional societies, and educational institutions whose members feel strongly that science and technology comprise the cornerstone of our nation’s future. Participants spent their first day in briefings about the federal budget process, then attended a reception with at least seven members of Congress and 60 congressional staffers. The next day was devoted to visits with legislators. AAS members met with 38 members of Congress or their staff, and the full cohort of visitors logged more than 1,300 such meetings. CVD participants discussed the importance of the nation’s broad portfolio of investments in science, engineering, and technology to promoting prosperity and innovation. Most importantly, they provided a constituent perspective on the local and national impact of these programs and their significance to virtually every region of the country. Roberto Avila, Michael Lucas, Margaret McAdam, and Carrie Black. AAS photo by Joel Parriott. More than 50% of all industrial innovation and growth in the United States since World War II can be attributed to advances pioneered through scientific research, with publicly funded research and development the vital foundation for today’s scientific and technological progress. Achievements from federally funded science, engineering, and technology include global environmental monitoring, lasers, liquid crystal displays, the Internet, and many other scientific and technical advances. Even astronomical research, sometimes considered of no practical value, has provided numerous tangible benefits, including major contributions to science education; applications of its technology in medicine, industry, defense, environmental monitoring, and consumer products; and opportunities for international cooperation. The federal government supports a unique research and education enterprise that fuels the American economy. This enterprise provides the underpinning of high-technology industries and expands the frontiers of knowledge in every field of science. Much of this research is carried out at academic institutions across the country ensuring knowledge transfer to future generations of scientists, engineers, mathematicians, physicians and teachers. Additionally, technology transfer from academic research adds billions of dollars to the economy each year and supports tens of thousands of jobs. Tom Koshut is a member of the AAS Committee on Astronomy and Public Policy. AAS participation in CVD was coordinated by Joel Parriott, AAS Director of Public Policy, and Joshua Shiode, AAS John N. Bahcall Public Policy Fellow. Special assistance was provided by Jennifer Greenamoyer, AAAS Science & Technology Policy Fellow at the American Institute of Physics, and Carrie Black, NSF Postdoctoral Fellow at NASA’s Goddard Space Flight Center. The American Astronomical Society (AAS), established in 1899 and based in Washington, DC, is the major organization of professional astronomers in North America. Its membership of about 7,000 also includes physicists, mathematicians, geologists, engineers, and others whose research interests lie within the broad spectrum of subjects comprising contemporary astronomy. The mission of the AAS is to enhance and share humanity’s scientific understanding of the universe. The Science-Engineering-Technology Work Group is an information network comprising professional, scientific, and engineering societies, institutions of higher learning, and trade associations. The sponsors represent more than a million researchers and professionals in science and engineering. The Work Group is concerned about the future vitality of the US science, mathematics, and engineering enterprise.